The GS66516B is an enhancement mode gallium nitride (GaN) on silicon power transistor. The properties of GaN allow for high current, high voltage breakdown and high switching frequency. GaN Systems implements patented Island Technology® cell layout for high-current die performance & yield. GaNPX® packaging enables low inductance & low thermal resistance in a small package. The GS66516B is a bottom-side cooled transistor that offers very low junction-to-case thermal resistance for demanding high power applications. These features combine to provide very high efficiency power switching. This Insulated Metal Substrate (IMS) evaluation platform can be used to evaluate the electrical and thermal performance benefits of GaNPX® E-HEMTs on an Insulated Metal Substrate for high power applications. 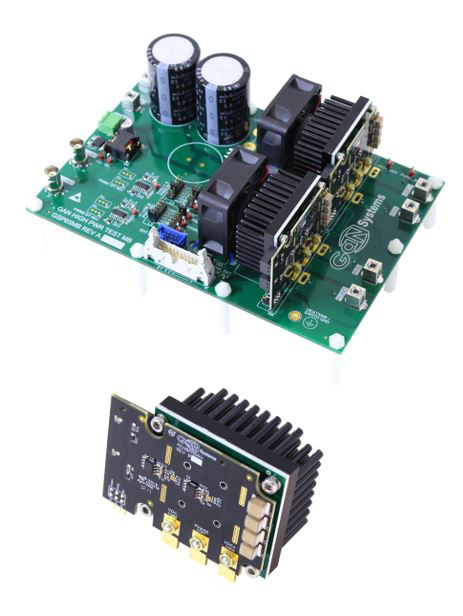 The platform consists of a motherboard and separate Half bridge IMS modules (3kW and 6kW). These assemblies can be configured into any of 12 different topologies, architectures and operating modes. The IMS Evaluation modules can also be purchased independently for use as a high power GaN intelligent power module (IPM) to be used with the designer’s own board for in-system prototyping.